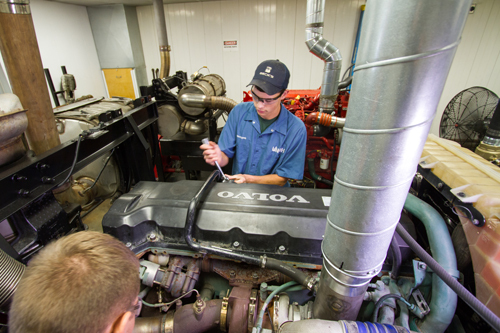 The University of Northwestern Ohio is excited to announce a new partnership with Mack Trucks and Volvo Trucks to be one of only three schools in the nation to offer the Diesel Advanced Technology Education (DATE) Program beginning in early 2019 to fill an ongoing shortage of skilled vehicle service technicians in the diesel industry. UNOH is nationally recognized as one of the premier institutions that train future Diesel Technicians. This strategic partnership will provide UNOH graduates who complete the DATE Program with job opportunities as highly skilled service technicians at Mack and Volvo dealerships. “Modern truck technology offers many benefits to customers, but it also requires advanced skills for maintenance and repair,” said Roy Walton, senior manager of aftermarket training for Mack Trucks Academy”. Applicants for the program will be carefully screened for attitude, ability and passion for the industry. Students enrolled in the 500-hour program will be trained to work on Mack and Volvo trucks specifically with course topics covering powertrains, electrical and electronic systems, chassis components and software and engine diagnosis and repair. The program includes theory, shop time, maintenance training, and testing. Training aids for the program are currently arriving on campus and reflect the most up-to-date Mack and Volvo models in the industry today. The DATE Program will be taught by dedicated OEM-master certified instructors at UNOH. Other schools offering the DATE program are Jones Technical Institute in Jacksonville, Florida and Western Technical College in El Paso, Texas. At UNOH, students will first complete their associate’s degree in Diesel, Auto/Diesel or Agricultural Equipment/Diesel Technology, and then, upon completion of the 12-week course, will receive a certification from the DATE program. These students will be prepared for immediate employment at any of the hundreds of Mack and Volvo truck dealerships across North America.